This is not a satire news, it's real! the President-elect Rodrigo Duterte has received praises from the three Catholic bishops. 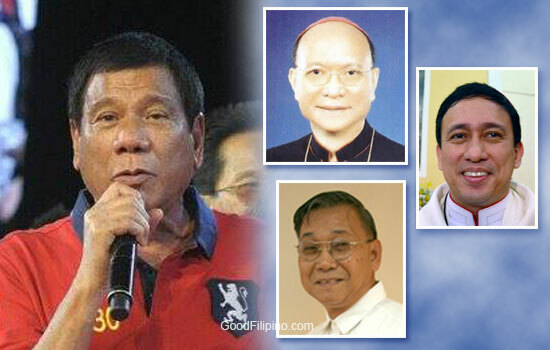 Direct from the Radio Veritas, three bishops acknowledge Duterte's simplicity especially in his upcoming inauguration ceremony on June 30, 2016. From the Diocese of Cubao, Bishop Honesto Ongtioco praised Duterte and said, "I am happy about the simple inauguration. We need to be simple even in our way of life." According to bishop Ongtioco, 'simplicity' is one of the important character of a great leader and an important value that must be possess. He said, "Simplicity, an important value that we have to promote"
On the other hand, the two bishops said "Duterte’s simplicity offers a good example to Filipinos and fosters solidarity with the poor." Bishops Antonio Maralit of Boac and Pedro Arigo of Puetro Princesa confirmed said that and it was published on the CBCP News. Meanwhile, the incoming PCO secretary Martin Andanar said that the venue was limited only for 500 people but eventually, it was increase into 600 plus invited guests. Andanar said on his interview with the press, "Talagang masikip lang talaga sa loob. Masikip sa loob ng Rizal Hall. Hindi siya ganoon kalaki ang espasyo. Limang daan lang kasi ang pwede na bisita so ang atin namang mga kasamahan sa RTVM ay sanay na naman sila sa broadcast pool. I don't think you will have a difficult time. " What do you think on the statements of the 3 bishops? Please point your thoughts below. Comments or suggestions about "3 Bishops praise President-elect Rodrigo Duterte" is important to us, you may share it by using the comment box below.